I have had a pot of cactus from Cameron Highlands some years ago, the cactus has died tragically because of the difference of cold highlands weather and hot weather. I was sad. A few months ago, my aunt gave me a pot of cactus. I was reluctant to accept the cactus because I did not want the cactus to die tragically, again. After I learnt that the cactus is from her friend who has grown the cactus in hot Singapore weather, I decided to take the small cactus home. The small cactus has grown happily since then. From one pot, now I have two pots of cactus, growing from a “single parent”. I put them outside my house where they can get sufficient sunshine. 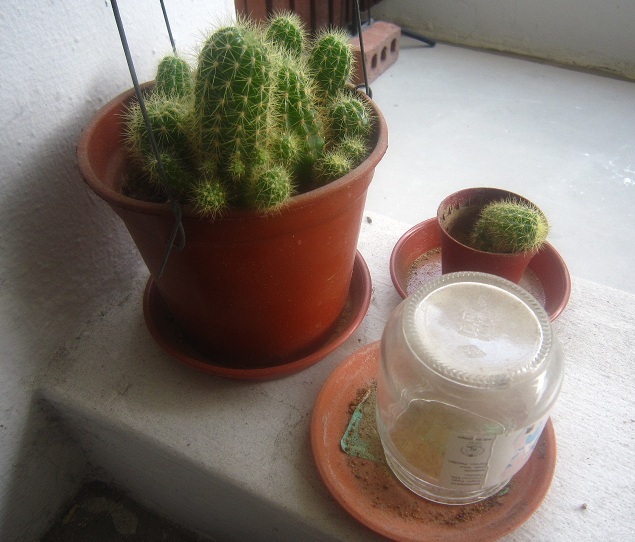 Still, one of the cacti has injured. 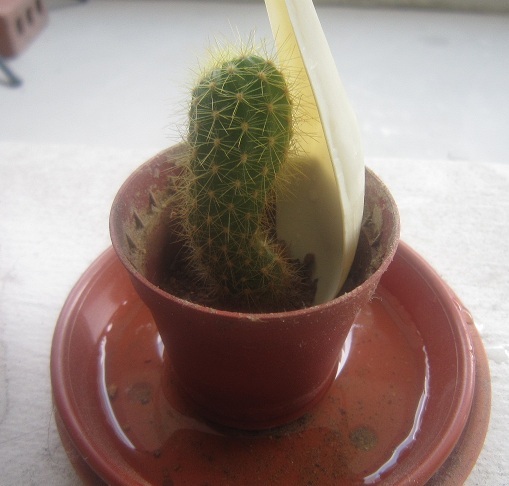 It is suspected that someone has injured the cactus. 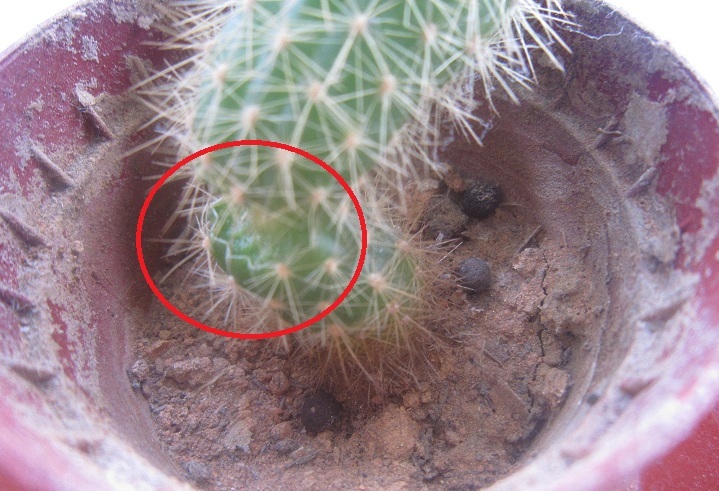 I notice the cactus is injured when the arrangement has been changed, as in the below picture. Poor thing, the cactus is almost broken into two pieces. Suddenly, I think of a way to “save” it. Have you encountered an injured cactus before? Can anyone tell me if the support method is able to help the cactus or make it worse? By Wendy in Plants on 15/09/2013 . Awww this is so sad…i can understand why it upset you. I love cactus & succulents and i remember in the beginning I always ended up overwatering & killing them. Thank you. The baby is growing well. I think you better cut the top off, let it dry for a few days and repot in soil with a lot of sand in it and a bit of grit or so, then water it carefully, just a few drops at a time. Your cactus will stay alive as it is now ofcourse but the shape is never going to be “normal” but it can be beautiful anyway ofcourse ! Thanks. I am so worried about it, because I have had bad experience growing a cactus before. Hopefully everything turns out right.